In December 2015, the United Nation general assembly adopted the first update to minimum standards on treating prisoners in 50 years - and named it in late South African president Nelson Mandela’s honour. The UN Standard Minimum Rules for the Treatment of Prisoners - known as the Nelson Mandela rules - contain 122 rules which “represent, as a whole, the minimum conditions which are accepted as suitable by the United Nations”. In this factsheet, we provide an overview of South Africa’s prison sector and list the biggest pressure points. 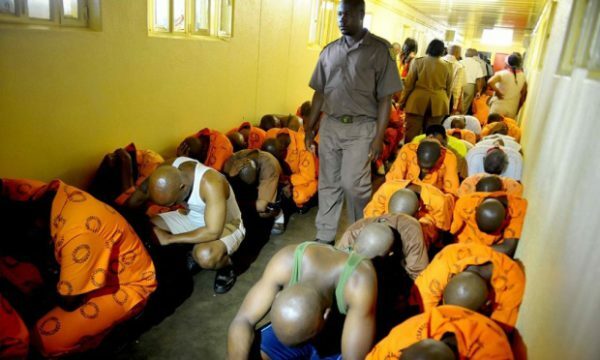 The Judicial Inspectorate for Correctional Services is the body tasked withoverseeing South Africa’s correctional services and inspecting and reporting on how inmates are treated. The inspectorate’s most recent annual reportnotes that South Africa had 236 operational prisons at the end of March 2016, with 7 “under some form of renovation” at the time. At the end of 2016, South Africa’s inmate population stood at 157,013 people, Singabakho Nxumalo, spokesman of the department of correctional services, told Africa Check. Most were men (152,889), with women making up 2.6% of inmates. A quarter of prisoners in the 2015/16 financial year were remand detainees, defined as people awaiting trial or those awaiting extradition. The number of these inmates has decreased slightly over the last 6 years, while the overall population remained relatively stable. Nxumalo also provided Africa Check with a racial breakdown of the prison population at the end of 2016. In answer to a June 2017 parliamentary question, the minister of justice and correctional services said that 11,842 foreigners were being held in South African correctional facilites. Of these 7,345 had been sentenced and 4,497 were awaiting trial, with 1,380 being prosecuted for being in the country illegally. The majority were Zimbabweans (41.5%), followed by Mozambicans (24%). Masutha also said that during the 2016/17 financial year it would cost an estimated R133,805.35 to house a prisoner. Considering the inmate population of 157,013 at the end of 2016, this adds up to R21 billion for the year. Theauditor-general’s report for 2015/16 stated that the department’s reported performance information for its incarceration, rehabilitation and care programmes wasn’t reliable “when compared to the evidence provided”. At the end of March 2016, South Africa’s prisons only had 119,134 bedspaces availablefor its 161,984 inmates. “The main driving factor behind overcrowding is the remand detainee population,” Clare Ballard from the advocacy organisationLawyers for Human Rightstold Africa Check. Wilna Lambley, the Regional Operations Executive in Gauteng for Legal Aid South Africa, told the Wits Justice Project that 8,000 people who can’t afford bail, end up in prison awaiting their trial. Clogged-up court rolls furthermore lead to delays and jam-packed communal cells. Prisons in urban areas have the worst overcrowding rates. In the 2015/16 financial year, Johannesburg Correctional Centre’s Medium B was233% full, which translates into a shortage of 1,736 beds. Rule 24 of the Nelson Mandela Rules states that the healthcare of prisoners is the government’s responsibility. These healthcare services include the treatment of infectious diseases such as HIV and tuberculosis (TB). Dr Malose Langa, a lecturer in the psychology department of the University of the Witwatersrand, conducted an analysis of torture in South Africa. He focused on cases reported in the annual reports of the Independent Police Investigative Directorate (IPID) and the Judicial Inspectorate for Correctional Services (JICS) between 2007 and 2011. In 2013,the Prevention and Combating of Torture of Person’s Act was introduced, which criminalised torture in South Africa. The Act’s definition of torture includes any act that causes severe mental or physical pain or suffering with the aim of extracting information or a confession from a person; or as a form of punishment or coercion. Despite JICS documenting 15 complaints of torture in its latest annual report, Luvuyo Mfaku, spokesperson for the National Prosecuting Authority (NPA), couldn’t provide the Wits Justice Project with the number of torture cases that has been prosecuted since the introduction of the act. Apart from assault, segregation - formerly known as solitary confinement or isolation - is one of the most common methods of torture used in prisons, according to Langa. With thanks to the Wits Justice Project, which use investigative journalism to expose miscarriages of justice, for input and guidance in putting this factsheet together.